Stone statues=Stone humans｜The stone statue with the foot of different colors. There are countless stone statues in Europe, especially in Italy. You may not be able to believe that those stone statues were moving formerly and had consciousness. I've often told about it until now and I have further deepened conviction when I saw them actually. We humans can't carve those stunning marble statues because the number of them are countless and the expressions of them look as if they were alive, and the folds of the garments of the statues are impressively artful. Some of the size of the statues is as big as just beyond imagination, and some of them are as small as toys. The atoms called Minanoko(small groups of atoms) is derived from orphan and they seem to be the child atoms and have become small statues and bricks. Atoms called Minanomono(big groups of atoms) are the subconsciousness of the adult atoms which seems to have become the adult statues. All the universe have made a great effort to leave the ruins and to keep the living humanity. I was told this foot hardened after taking off the sandals so that the shape of the foot would look clearly. The humanity can never carve marble like this. There are countless stone statues whose sculptors are unknown and look as if they were alive. They have been excavated from the soil. The mason of today told in the TV program they can never carve the complex shape with the marble. He told they can not drive the chisel into the marble because only one drive would make lots of crevice on the surface of it. Therefore the only work of art with marble that he can carve is an egg, he said. The bodies of Stone humans seem to be made by combining the parts. 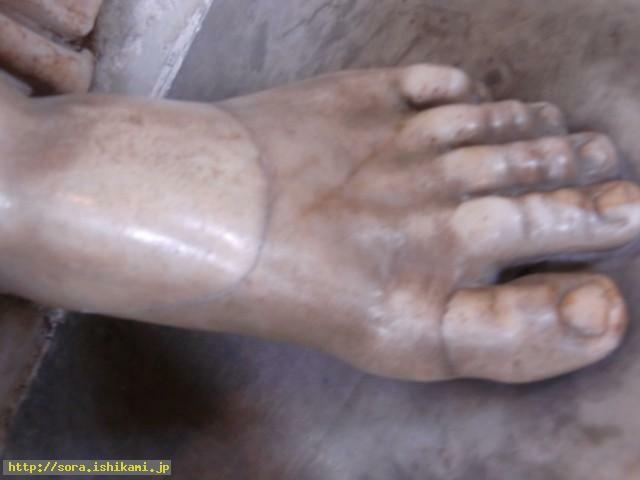 The foot of this statue have the combined big toe(? ).